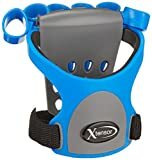 Whether you’;re a professional athlete building muscle and strength or recovering from an injury the Xtensor will help extend the life of your hands. The Xtensor allows you to regularly exercise your fingers hands forearms in a safe and controlled way. The exerciser has an ambidextrous design for use on either hand and includes instructions and suggested exercises. Comes complete with 10 finger bands comfort pad and instructions.